These classic Tree Topper/Window Decorations are from the 1960s to 1980s. 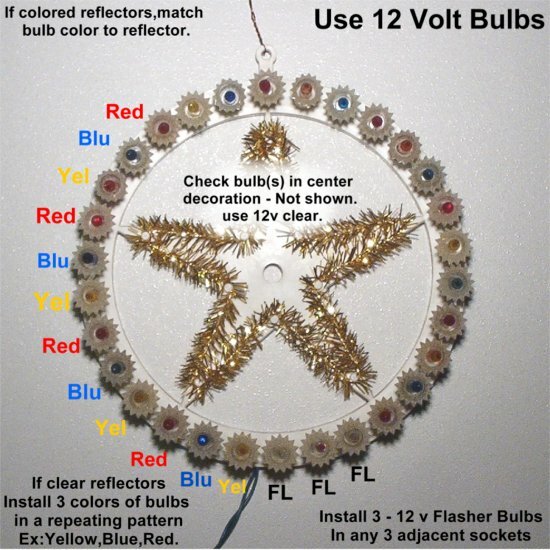 The basic design used 30 lights arranged in a round decoration about 7 inches in diameter, and wired in a 3-way flasher circuit to give the effect of a multi-colored twinkling halo or wreath. 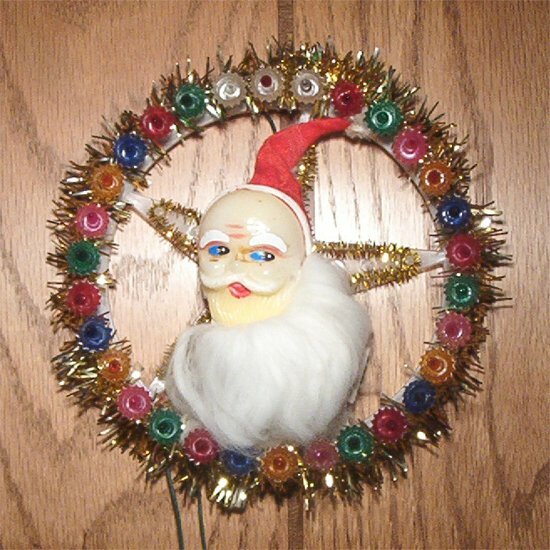 Several names were used such as "wreath of spinning lights" or "Santa wreath". Various lighted decorations were placed in the center to fill it out. There was one safety consideration, though. The lights had to be set to twinkle. If set to always on, (by replacing the flasher bulbs with regular bulbs) the heat build-up could melt the reflectors! For this reason, these Tree Toppers are no longer made. I still use them as window decorations. would overheat, resulting in a nuclear meltdown! Here are some tree topper/window decorations from my collection. Click on the mini image to see the full size version, then use your browsers back button to return. 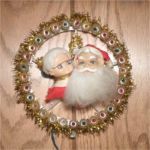 A 32 light topper with Mr. and Mrs. Santa Claus. Here is a mini movie showing the Mr. and Mrs. Santa Claus tree topper lit up. It's very colorful, flashing in red, yellow, and green . The video is a 1.8 MB, 25 second loop. (Broadband recommended). 31 light topper with a Santa decoration. Note that the reflectors are tinted to match the bulbs. 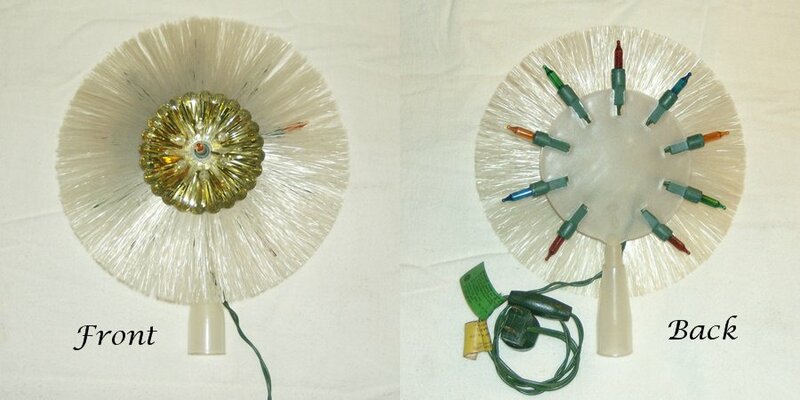 A slightly different Santa wreath style L274, made in Taiwan, with clear reflectors. 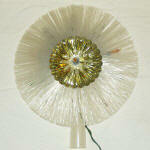 The box states "A quality decoration made for advance imports 20 W. 23 N.Y.C. 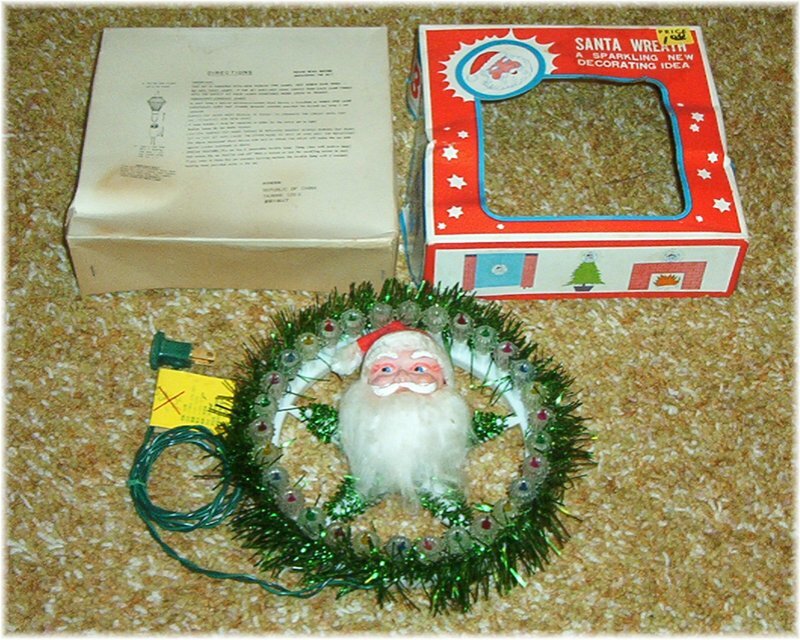 N.Y."
This set includes the box, which shows several decorating suggestions such as tree topper, wall plaque, and window decoration. The cord tag reminds the owner - "Do not twist the bulbs!" 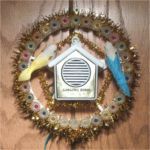 A lighted wall plaque with a bird decoration by Santa's World, style no JEL 507.
then it drove you NUTS! A sound clip is included. Warning - Annoying sound ahead! 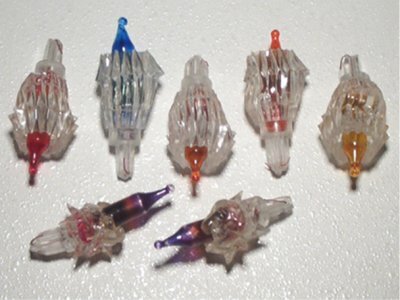 Watch a YouTube video of this set flashing and chirping away! 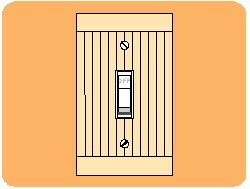 Use this diagram as a guide for re-lamping these tree toppers. 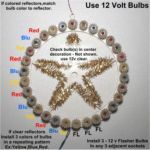 I have found that it is best to replace all of the original bulbs with modern ones because they burn cooler, which minimizes the chances of melting the reflectors. This diagram shows a 3 color scheme, but these were also made in a 5 color scheme. Merry Midget rainbow tree topper by General Electric, catalog # RTL2-10, made in Taiwan. 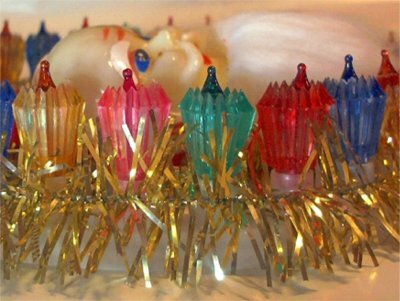 This decoration has 10 bulbs with fibers in front to create a rainbow effect and dates to after 1974. In April 2008 I received several photos of tree toppers in more styles from an anonymous collector. Vintage sets Light bulb testing How old is it?